Amazing the power that a photo has. 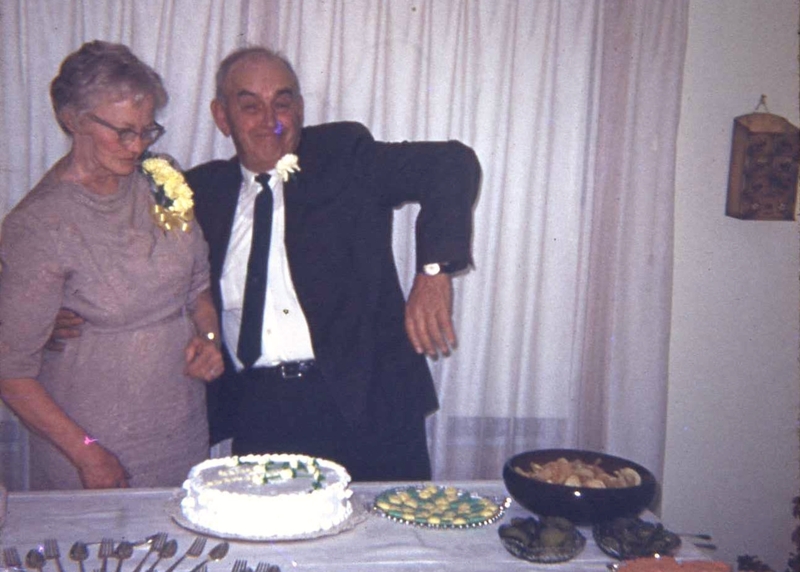 These photos were taken at my grandparents’ 50th wedding anniversary party at their home in Marcus, Iowa, some 40 years ago in the early 1970s. I wasn’t even there that evening. It was a card party for their friends and relatives. No kids allowed. However, I probably saw these slides dozens and dozens of times. And every time we watched them, we would laugh as Grandpa wound up and laid a wet one on our Grandma. No doubt, without this slide, I would not know of this moment. But because of it, I can remember my grandparents. My gentle, inventive Grandpa and my tough, creative Grandma. I can see them kiss forever. I’m so glad that we were able to celebrate my parents’ 50th anniversary later in Paullina. This image certainly back memories of them. My mother was a person with a rod of steel in her back. The fact that she could live through her terrible cancer, endure what were experimental procedures with radium needles, and then triumph after years of reconstructive plastic surgery is an amazing story that, sadly, will porbably never be told. As usual, your blog is amazing. I have looked up info about these early treatments at Mayo, but I could not find much. I wish I knew more about it. Great pics and many fond memories of grandpa and grandma! Here’s to Sweet Memories and a loving family! Beautiful tribute! 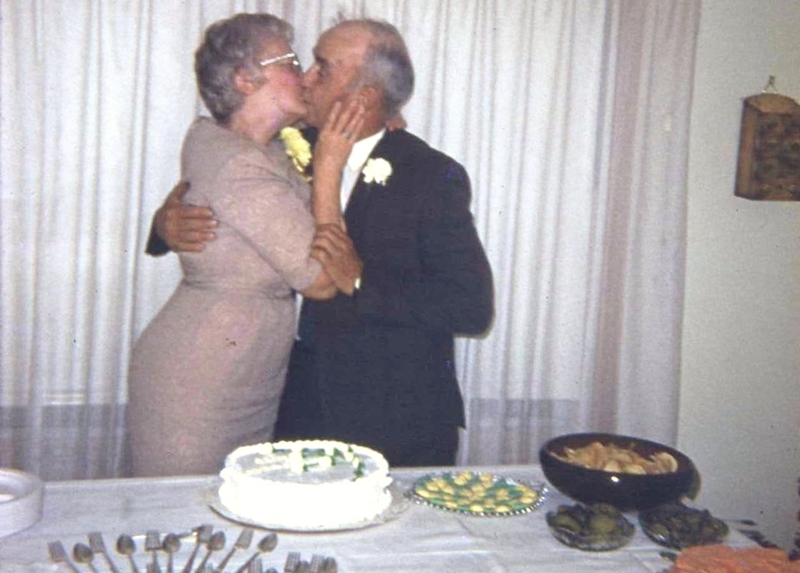 Thanks for posting these pictures of Grandpa and Grandma. I remember Dad putting on the family picture shows and I miss those times. Wish I had a slide projector and all those slides to show my kids. I would like to know more about Grandmas fight with cancer. I think Dan has written about his memories of that difficult time.